When I signed up for Team in Training again, I really wanted to make more of an effort to go to team runs, but because of my swim, travel, race schedule, my team training record is pretty much on par with me team tri training record. The difference is that this time I am actually training. :) And, since I am getting together with some of my team members (like for this 5k/10 mile), I guess we can call it small group team training. We looked at the weather for the weekend, knowing with the Cherry Blossom 10 miler the weekend we were supposed to do 13 with the team, that we wanted to run 15 miles and decided Sunday looked like the better of the two days. (Also, I wanted to not have to worry about getting up early on Saturday morning, even though I did anyway). Boy were we WRONG!!! I woke up on Sunday morning to the sound of rain on the skylight in my bathroom. Since I had heavily pushed to do the run on Sunday instead of Saturday, I knew I had to get up and get ready to run, rain or shine. But in this case, it meant rain or freezing rain. I got a text from Joanna double checking that I still wanted to run, so I replied yes and texted Lauren to let her know we were still on. Then I found out Kristin had emailed about hurting her foot and was out. 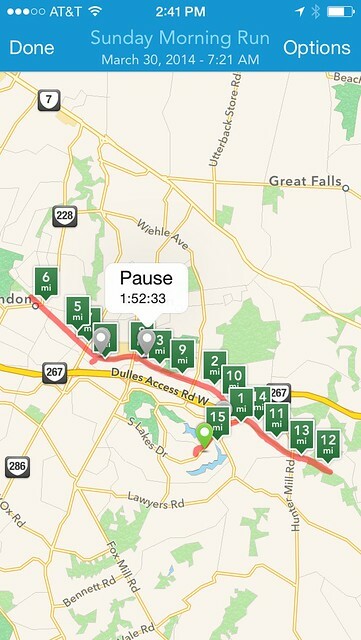 So Joanna, Lauren, and I set off on a very rainy planned 15 miles. 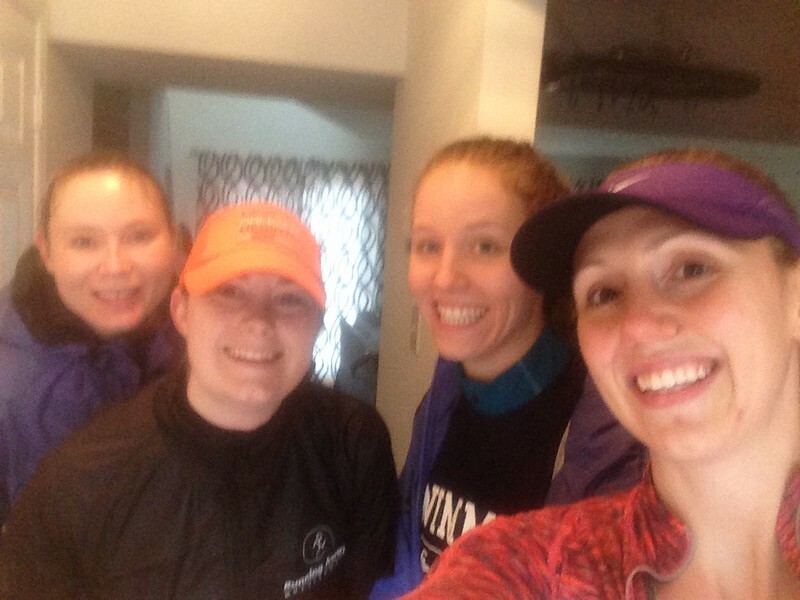 We ran out from my house on the W and O trail towards Herndon, turning around just past the train station, picked up Amanda on the way back, then ran out about 1/2 way to Vienna, at which point the rain actually started to let up! We thought we were in the clear when we got back to Starbucks for our 0.6 mile walk back to my house. 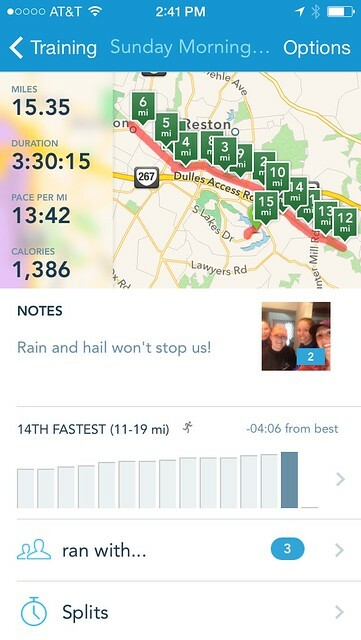 (the original plan was to run 13 ish miles and walk the last two with coffee, but because of the weather, we ran all but the last .60 because we didn't want to walk in the rain) Unfortunately, as we left Starbucks, it started HAILING.... or was it sleet? We had a bit of a debate about which it was, because it sleets in the winter and hails in the spring and summer. With a run like that (and the snow that followed that day) on Sunday, it's hard to believe that it's been in the upper 60s this week! But I guess that's spring weather for you! On Saturday my body betrayed me when I thought I would want to sleep in and I was wide awake at 7am, so I went to watch my cute little swimmer, Nate, run a one mile kids race! I have been coaching him in swimming since he was two (almost three, since he's an end of the summer baby) and I can't believe how grown up he's gotten. 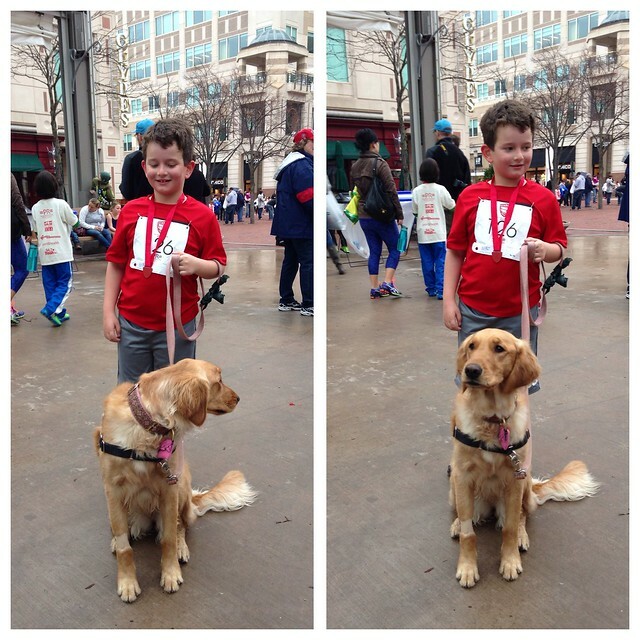 Not only did he work so hard during his race, but he wanted to walk and take care of Penny the entire time we were there! I think the whole "a boy and a dog" thing goes not just boys and their dogs, but pretty much any boy and any dog. Penny took to Nate right away. It was so sweet! Nate's dad, who's also doing the Cherry Blossom next weekend, ran to the race. Even though it was misty and sprinkling on and off on Saturday morning, it was definitely the better day to run!